Home invasions are unfortunately on the rise and so is the need for intrusion detection. The Wireless Home Security System by HomeSafe® is an affordable alternative to expensive month to month services. 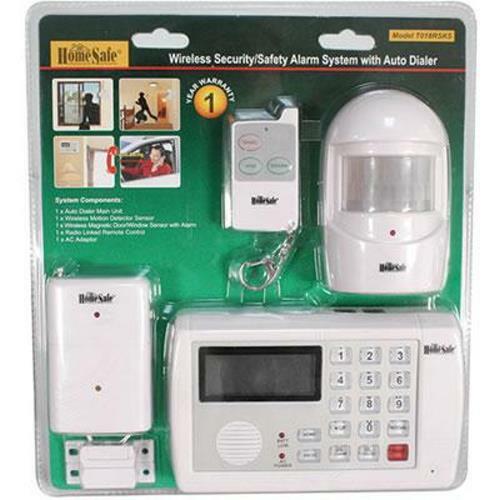 This easy to install and operate security system is expandable and comes with a wireless motion sensor and wireless door or window sensor. Whenever the main unit is set at ARMED, the wireless motion detector sensor or wireless door/window sensor will alert you if any movement or entry. If movement or open door/window is detected the sensor sounds an alarm and signals the base unit to call the first of up to 5 programmed phones numbers. The person that answers will have the option to listen-in, broadcast voice over the built-in base unit speaker or disarm the system. System can also be set to chime mode to alert of entry, great for stores or shops to let you know a customer has entered.